The Fake MSE Alert is a rogue Anti-Malware. 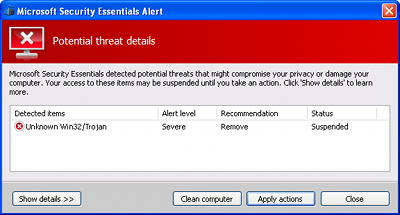 It displays fake alerts and warning messages to scare users, showing a choice of Antivirus Solutions to clean the system. This trojan blocker prevent all software execution. Infected Users need to send a text call to get a valid serial number to remove the Trojan. 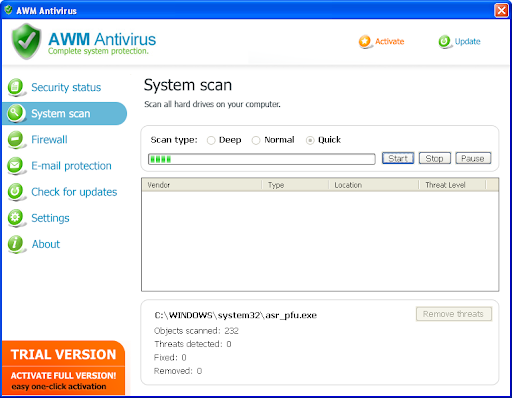 If your PC is infected with AWM Antivirus use MBAM to remove the infection. Advanced Security Tool 2010 is a fake Antivirus tool. It is from the same rogue family as Security Central, Home Personal Antivirus, XP Deluxe Protector, Win PC Antivirus, Win PC Defender, XP Police Antivirus, IE-Security, WinDefender 2009 and Total Secure 2009. If your PC is infected with Advanced Security Tool 2010 use MBAM to remove the infection. This trojan blocker prevent all software execution. To remove the malware, infected users need to send a phone text message to get a valid serial number. 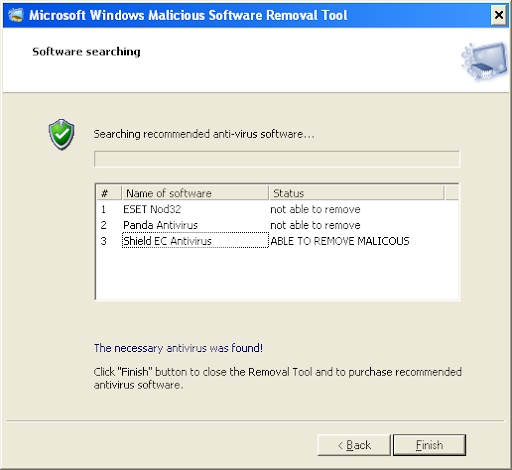 If your PC is infected with Security Suite use MBAM to remove the infection. 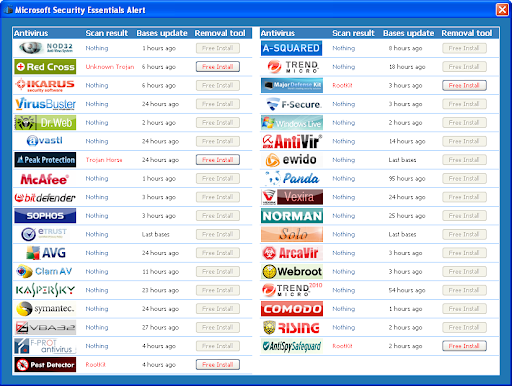 This Removal tool is a fake Antivirus. 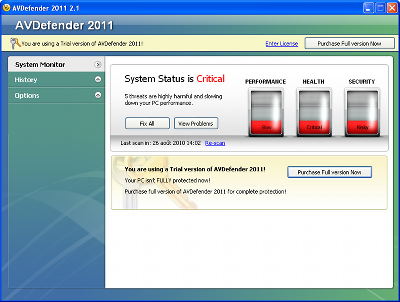 It acts like a legit Windows tool, but display fake alerts to push users into buying a license. 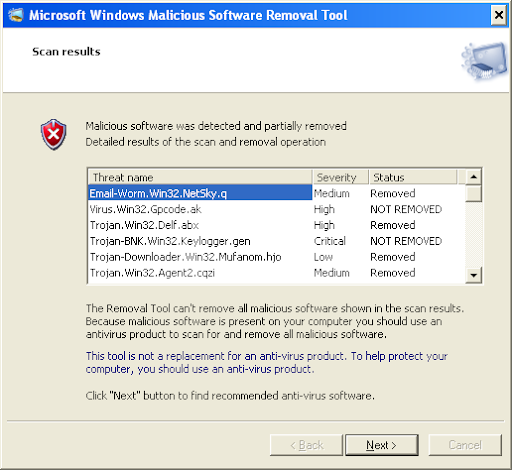 If your PC is infected with this Fake Microsoft Windows Malicious Software Removal Tool use MBAM to remove the infection. Wireshark Antivirus is a fake Antivirus. 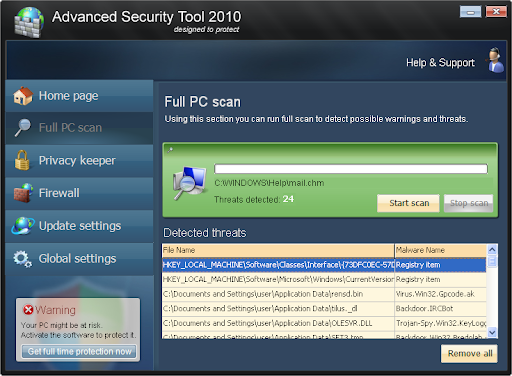 It is a clone of Sysinternals Antivirus, XJR Antivirus, AKM Antivirus 2010 Pro, Your PC Protector. Wireshark Antivirus prevents legit softwares execution, displays fake alerts and blocks random Web pages. If your PC is infected with Wireshark Antivirus use MBAM to remove the infection. 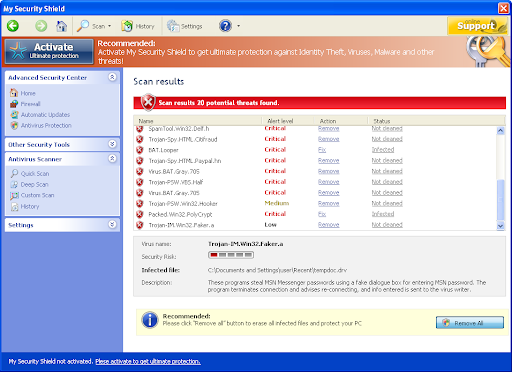 If your PC is infected with My Security Shield use MBAM to remove the infection. 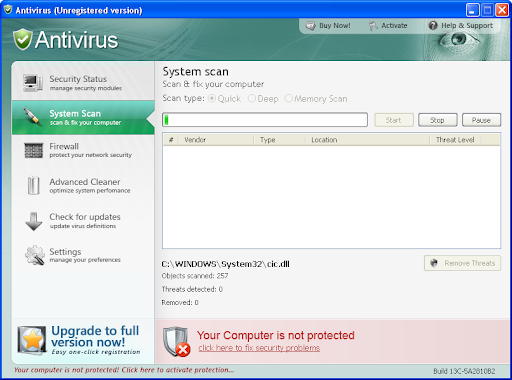 Antivirus (AnVi) is a fake security application. This rogue prevents legit softwares execution, displays fake alerts and warning messages. Antivirus (AnVi) also detects non existent infections to scare users. It is from the CoreGuard family (Defense Center, Protection Center, Data Protection, Digital Protection, Your Protection, User Protection, Dr. Guard, Paladin Antivirus). 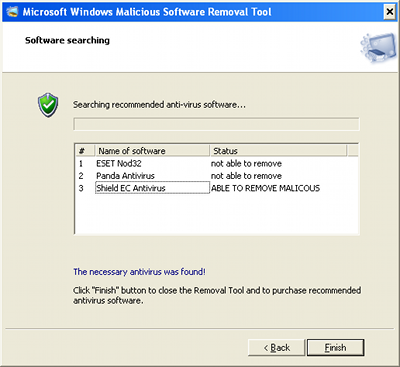 If your PC is infected with Antivirus (AnVi) use MBAM to remove the infection.